The New England Patriots and the Tampa Bay Buccaneers last met in Week 3 of the 2013 season. The Patriots defeated the Buccaneers 23-3 at Gillette Stadium on September 23, 2013. Quarterback Tom Brady and rookie wide receivers Kenbrell Thompkins and Aaron Dobson started to click for the first time that season, as Dobson led the way in catches with seven and Thompkins had two touchdowns on the day. The Buccaneers offense struggled as they turned the ball over twice on downs. Rian Lindell missed a 38-yard field goal attempt; and quarterback Josh Freeman threw an interception that led to a Stephen Gostkowski field goal right before the end of the first half. It was Patriots’ kicker Gostkowski who added the only other scores in the second half of the game. He connected on two more field goals, one in each of the third and fourth quarters. He went three-for-three on field goals and two-for-two on extra points for the day. After the victory over the Buccaneers, the Patriots began the 2013 season at 3-0 for the first time in six seasons, while New England’s defense had allowed just 34 points through three games. The defense held Buccaneers’ Doug Martin to 88 yards on 20 rushes just one week after he had 144. They also held Vincent Jackson to three catches and 34 yards before he left the game in the third quarter with a rib injury. New England’s offense was without Rob Gronkowski and Danny Amendola that game, which forced Brady and the rookie receivers to connect and make the plays to get the job done. Tom Brady went 25-of-36 for 225 yards, two touchdowns and one interception. The Bucs’ Josh Freeman competed 19-of-41 for 236 yards and one interception. LeGarrette Blount rushed 14 times for 65 yards, with a long of 23 yards, while Brandon Bolden had three carries for 51 yards and a long of 46. For Tampa Bay, Doug Martin led the way with 20 carries and 88 yards. New England’s receiving efforts were led by Aaron Dobson who had seven receptions for 52 yards. Kenbrell Thompkins added three catches for 41 yards and two touchdowns. It was Mike Williams who led the Buccaneers with five receptions and 65 yards on the day. On the defensive side, Jerod Mayo led the Patriots with nine total tackles, five solo tackles and one sack. Chandler Jones also contributed a sack on the day, while Rob Ninkovich and Tommy Kelly posted a half sack each. Tampa Bay’s defense also played pretty well with Mark Barron leading the way with 11 total tackles, eight solo tackles and a half sack. Adrian Clayborn and Akeem Spence each posted a sack while Lavonte David recorded a half sack. It’s game day, #PatriotsNation! 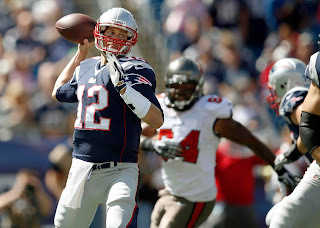 New England is at Raymond James Stadium to face off with the Tampa Bay Buccaneers on Thursday Night Football. Game time is set for 8:25pm.